Such achievements bear eloquent testimony to Resorts World's status standing as a world class resort, and as a global brand, which further fortify Genting - City of Entertainment as one of Asia's leading integrated entertainment, leisure and hospitality destination. The idea of a hill resort derived when the late Tan Sri Dato Seri (Dr) Lim Goh Tong was working on a hydroelectric power project at Cameron Highlands Resort in 1964. It was then that he foresaw his dream of having a cool mountain resort that is within reach of all Malaysians for a cool getaway every now and then from the tropical heat. After having done a research, he found an ideal site at Gunung Ulu Kali and commenced construction of the access road in 1965. He faced many challenges, including bankruptcy during the course of the development which many thought was an impossible task and had advised him to drop the project but with his determination, the access road was completed within 4 years in 1969. He had against all odds, turned his dream into a reality. On March 31, 1969, the late Tunku Abdul Rahman, Malaysia's first Prime Minister graced the official laying of the foundation stone for the company's pioneer hotel the then Highlands Hotel (now renamed Theme Park Hotel), marking the completion on the access road to Genting Highlands Resort. 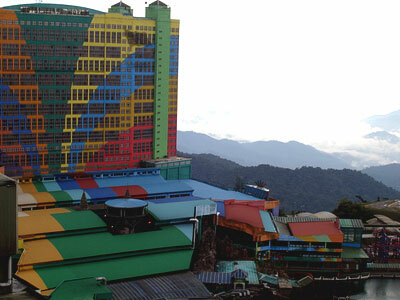 Since the opening of the first hotel in 1971, Genting Highlands Resort has continued to grow from strength to strength. Today, Genting Highlands Resort is recognised internationally as a world class resort with 6 hotel properties comprising of Genting Hotel, Highlands Hotel, Theme Park Hotel, Resort Hotel, First World Hotel and Awana Genting Highlands Golf and Country Resort with over 10,000 rooms ranging from 3 to 6 star accommodation from its start up of only 200 rooms in one hotel in 1971. In addition, it offers indoor and outdoor theme parks with over 60 fun rides and entertainment attractions, over 90 dining outlets, 80 retail outlets, convention and international standard show facilities - all these while maintaining the natural beauty of the rain forest. The various components of First World Complex, namely the First World Hotel, First World Plaza and Genting International Convention Centre were progressively opened from 2001. 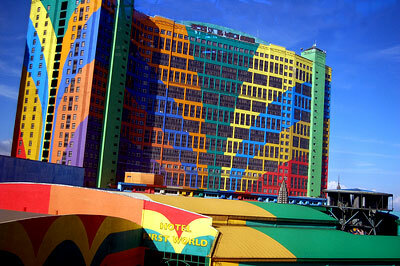 First World Hotel is also the World's Largest Hotel with a total of 6118 rooms as endorsed by the Guinness World Records in November 2006. Apart from Genting Highlands resort, Resorts World Bhd also owns and operates Awana Kijal Golf, Beach and Spa Resort in Terengganu and Awana Porto Malai in Langkawi. Over the years, Resorts World Bhd has carved its name solidly as one of Asia's leading integrated entertainment, leisure and hospitality operator. Located at 2,000 meters (6,000 feet) above sea level, the renowned Genting Highlands Resort with its myriad attractions is a significant contributor to the tourism industry of Malaysia. Genting Highlands Resort, popularly known as the City of Entertainment, has recorded steady increases in visitor numbers annually attracting over 19 million visitors a year and these include tourists from around Asia, India and the Middle East. "We place great emphasis on our branding exercise. Our consistent branding has definitely worked for the company," said Lee. "When you talk to people from different countries, you'd be amazed at all the positive things they say about Genting Highlands Resort. In places like China, Vietnam and Indonesia, it is one of the most popular places they know in Malaysia. They will tell you that they know a great deal about our resort." "Genting Highlands Resort is definitely a must-see destination with its grandness, luxury setting and splendid view. It is one of those places on your checklist when you come to Kuala Lumpur. In fact, The Star conducted a survey of favourite places in the country and Genting Highlands Resort came first in the survey. We are definitely proud of it." Lee Choong Yan, President of Resorts World Bhd.